Two balls, players follow their passes. 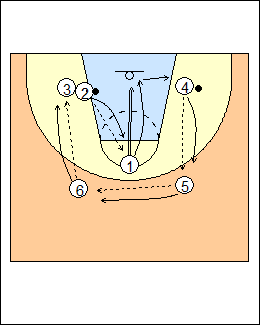 2 passes to 1 and follows to get a hand up, 1 shoots and rebounds, at the same time swing the other ball from 4 to 5 to 6 to 3. 2 is the next shooter. 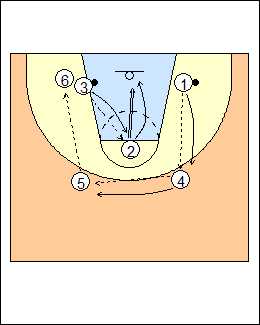 The pattern continues, 3 passes to shooter 2, swing the other ball from 1 to 4 to 5 to 6. See Shooting - Star group.